What better way to engage the creative mind then by solving a puzzle that engages logical reasoning skills as well as incorporating basic Sudoku skills to solve a puzzle. 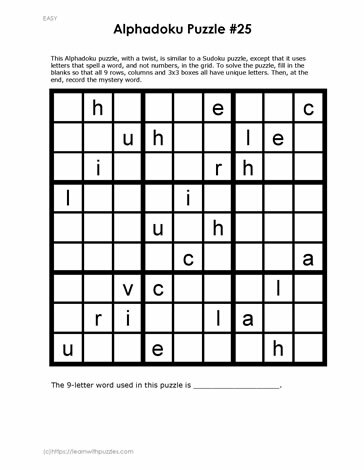 Using a unique nine letter word this Alphadoku puzzle requires the puzzle solver to use basic Sudoku puzzle skills to complete the grid. Once the puzzle is completed record the unique nine letter word on the line provided at the bottom of the page.